Roll - Play - Settle! Discover, explore, and settle Catan anywhere and anytime! …even all by yourself! 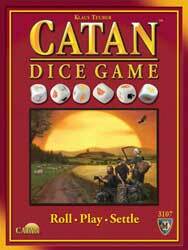 The Catan Dice Game® is the perfect portable adventure experience. Play it in only 15-30 minutes! It’s a great casual introduction to the world of Catan. With 6 colorful, embossed wooden dice and your scoring map, you can roll—and risk— your way to victory. So get ready to toss! Challenge the odds and discover a fresh way to master Catan!